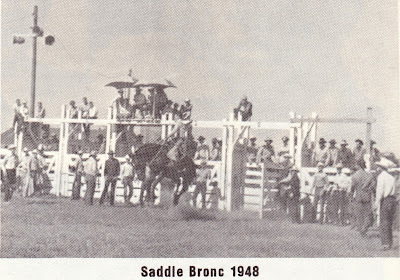 This picture was taken from the top of the Golden Spike Tower in North Platte, looking south over the South Platte River. Unfortunately, those aren't Sandhill Cranes, they are Canadian Geese. 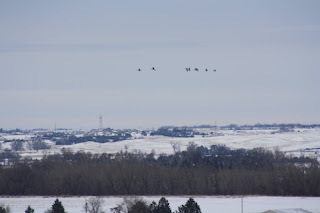 The Sandhill Cranes on their annual migration should arrive in the Platte River Valley any day now. Unfortunately, for our big "Cranes and Trains" kick-off event, the only ones that were there were the ones that we brought. Fortunately, there were LOTS of trains. 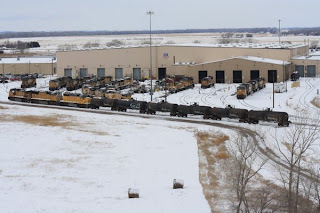 This shot is from the seventh floor observation deck of the Tower, looking at the Diesel Shop. This picture is also from the seventh floor of the tower. 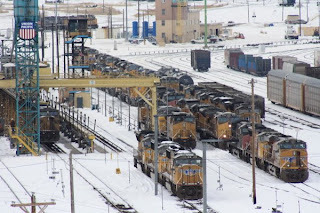 If you look just to the right of the big Union Pacific shield, you will see the little glass box that is Mark's office when he works the tower. Below that you can see all of the units he is working with. Here is the guest of honor at the "Cranes and Trains" event, artist Jeff Gauthier. 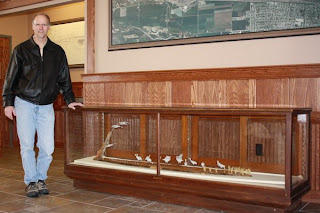 He created the wood carving in the wooden case, which he donated to us for display in North Platte. He has more than 200 hours in this beautiful carving, "Platte River Rendezvous", which depicts Sandhill Cranes in the river. 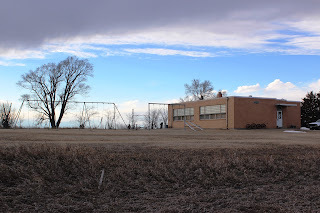 The display case in which it is housed is from the old North Platte Depot - you know, the one that hosted the North Platte World War II Canteen. 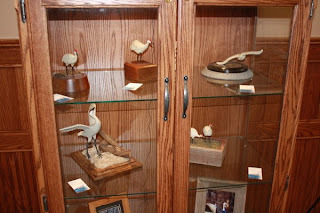 The carvings below are also on display, and are from local artist Ron Meyer. 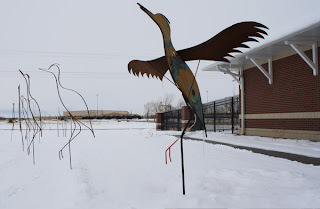 The Cranes and Trains exhibit will run through the first of April in the great hall of the Golden Spike Tower and Visitor Center, 1249 N Homestead Road in North Platte. Thousands of Sandhill Cranes will begin arriving soon and will stay in the valley through the first part of April.